Before Dasha’s birth, an evening in was a rarity. If we weren’t visiting friends, family, or the climbing gym, we were sipping on Bubble Tea at our favorite cafe while engrossed in our Kindles. Nowadays, I’m ecstatic when I manage to lull the dragon into slumber at 7pm, and then wander the living room at a loss – what the hell to do with the two remaining hours at absolutely zero strength? Apparently, salads are the answer. The past week, I’ve been on an arugula kick. Why did it take me so long to discover arugula? So much better than lettuce! More zesty, funner texture. One pre-washed package lasts for three salads for two people. It’s also the pineapple season (or so it looks from the spiky rows at two bucks per head). And while I’m exploring greens, Levon is has been acquainting himself with the Anova Precision Cooker (a sous vide machine he backed on Kickstarter). Thus, out of fatigue and last minute experimentation, the Salmon & Pineapple salad was born! The result was light, juicy, on the sweeter side. Methinks the salad lacked a subtle punch – next time I’ll try adding some dijon mustard into the dressing, half to a full teaspoon. 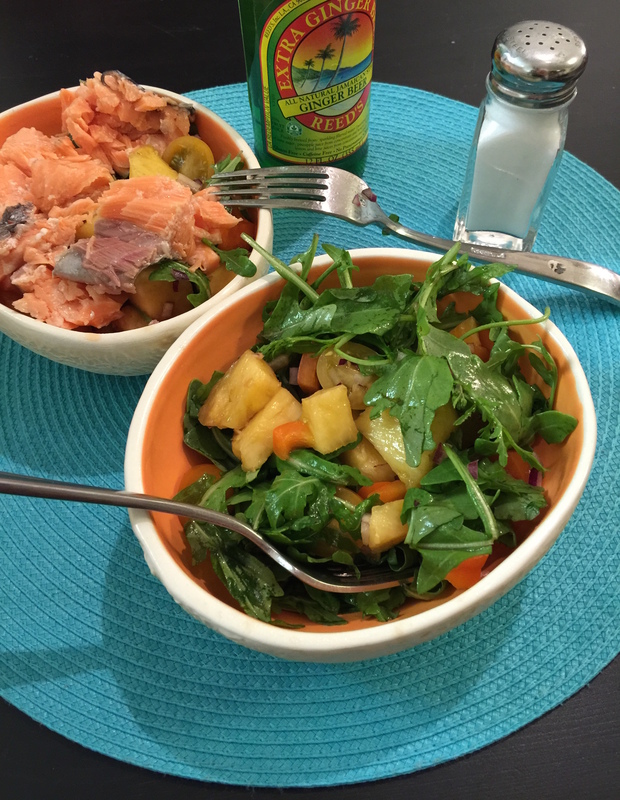 This entry was posted in Life/Personal and tagged Anova Precision Cooker, arugula, dinner salad, kitchen experiment, orange pepper, pineapple, pineapple salmon salad, quick salad, salmon salad, salmon sous vide, sous vide, zima tomatoes. Bookmark the permalink.